We’ve been using the CoinKing multipool for over two weeks already, trying it out, and we are ready to share some feedback based on our own personal experience. When we have started with CoinKing it was one of the most profitable automatic profit based coin switching pool according to PoolPicker and currently it is still the most profitable one for few of the crypto algorithms supported by the service. CoinKing offers an nice looking and easy to use service, supports a lot of coins and most of the more popular algorithms and gives the users an option to automatically exchange the mined coins not only in the more traditional BTC and LTC, but in many other coins as well. The standard pool fee is 1% and if you decide to use the automatic exchange of the mined coins into some other crypto currency there will be another extra fee for the conversion process (the fees are the ones charged by the exchange used for the conversion), different based on the coin you select to get the payout in. Another very useful thing that we’ve liked a lot is the list of many notifications that you can activate manually, so you know when the pool does something like automatic payout or coin conversion etc. 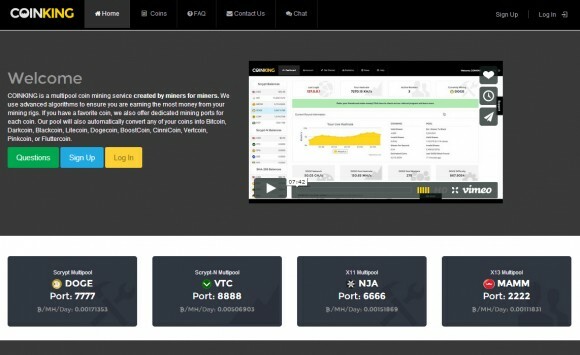 The pool has Scrypt, Scrypt-N, SHA256, X11 and X13 multiports and you have the option to either mine in a multipool configuration with CoinKing choosing the most profitable coin at the moment based on the exchange price and network difficulty or to mine directly a specific coin you choose from the list of supported ones. We like that CoinKing is constantly adding new coins, so that the profitability for the miners can remain high and some coins do get removed as well for the same reason. 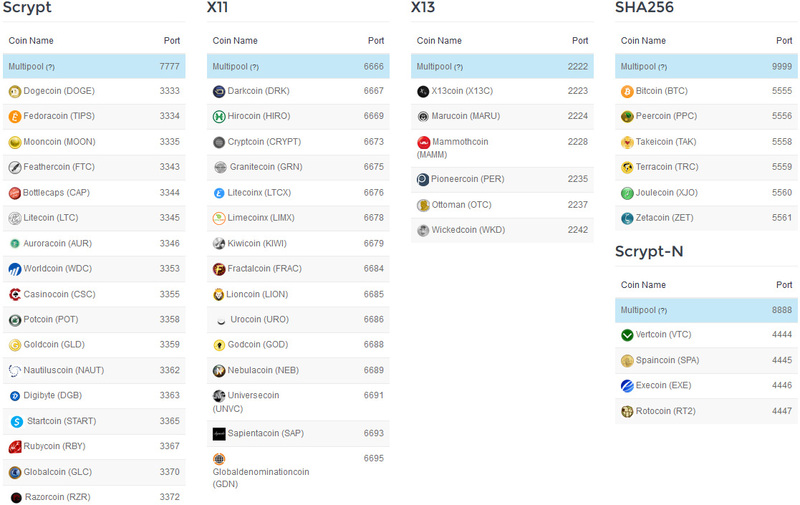 It is no wonder that the poll is keeping top places in terms of profitability as many other pools kind of forget to add new coins and remove old ones thus mining no so profitable coins and offer a lower additional profit. In CoinKing you will see that the highest number of supported coins is in the Scrypt and X11 domains as with the other supported algorithms there are not so many coins available, or at least not so much that are more established and offer good profitability. One of the best things we like the most with CoinKing is the fact that you can select not only to mine specific coin or the automatically the most profitable coin, but also can get what you have mined automatically converted to a coin of your choice. You can either individually set if the coin should be converted automatically or not or do it all in a single click for all coins. Furthermore you can select to convert one mined coin into another of the supported and you set that on per coin basis, so you can mine LTC and have them converted in BTC, but you can also set to mine DarkCoin and have the mined coins automatically converted to BlackCoin for example. Yes, there is support for automatic conversion into coins that have finished their POW phase and are now POS only. 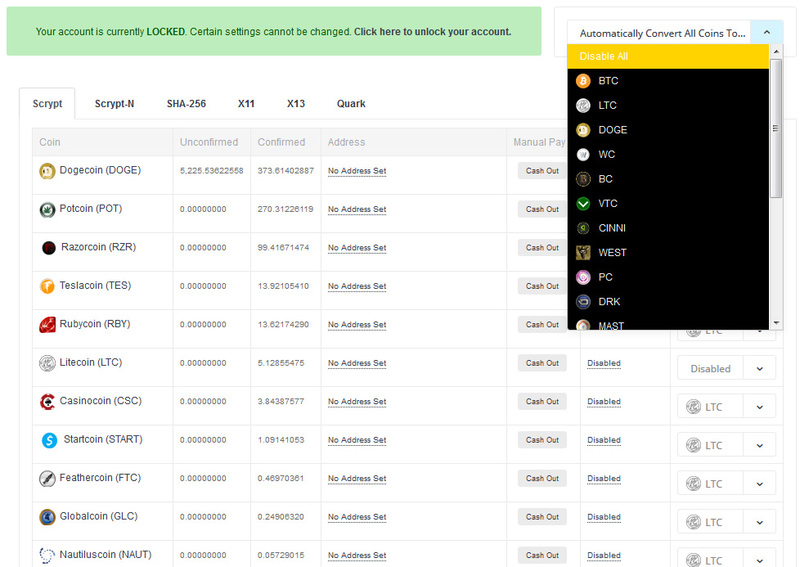 Currently there are 19 different coins that you can have your mined coins automatically converted into and in this list more coins are being added as well, including POS only coins. This way POS only coins can get buy support from users that want to mine the most profitable coin and get instead a coin of their liking that they want to support such as Minerals for example. Now, if everything does look too good to be true, then there is some catch. Well actually we found one thing that we did not like that much using the service. According to the information on the website the automatic conversions should run 4 times a day, or every 6 hours, but we’ve seen these happening more like once a day. There are some minimum limits for a conversion to be executed, but in order for miner with smaller hashrate the mined coins should be combined and exchanged. This however does not seem to be running so well or the limits may be too high, as after two weeks of use we still have some coins that have not yet been converted. Another not so convenient thing is that when a new coin gets added in the pool you need to manually go and configure the automatic conversion for it, as by default the conversion is disabled, so you need to keep an eye on the news section of the pool. In general however we are satisfied with our experience using the CoinKing multipool, we haven’t had serious problems so far, and can recommend you to try it out yourself if you are looking for a new place to mine. Do note however that some people had various issues with the pool, so if you have experienced some yourself feel free to share them below. The thing is that older pools do tend to keep for long coins that are no longer profitable to mine and do not add new profitable coins that often. That is why it is a good idea to be on the lookout for new services that might offer better profitability if you do not want to risk it mining new crypto coins that are currently launching. With so many new coins launched that turn out to be scams from developers that want to make some quick cash by pumping and dumping premined or IPOed coins it is no wonder that more people get back to multipools as a safer alternative for better profit than directly mining for a fixed coin. 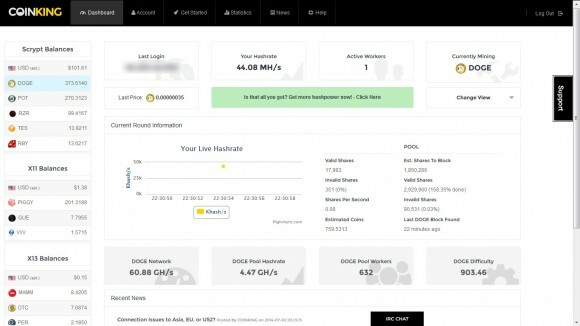 We’ll be doing a more detailed review of this multipool soon as we have just started testing and playing with it, but so far it looks very promising and profitable especially for owners of Scrypt or SHA256 ASIC miners.